Do you know why Umbria is called the Green Heart of Italy? Because of its very central (both longitudinally and latitudinally) location on the Italian territory, and because it vaguely resembles the shape of a real heart. I'd stress vaguely. Nevertheless once you have looked at it on the map you cannot disagree with this concept. Umbria is one of the few central regions in Italy that does not have access to the sea. 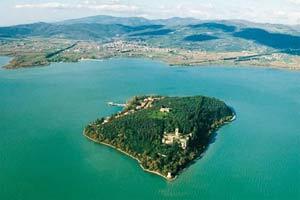 However it presents some major beautiful bodies of water, like Trasimeno, Piediluco and Corbara Lakes. Did you know that Lake Trasimeno is among the shallowest you can find? Just 7 meters at its deepest! But it is the fourth largest in Italy, extending for 128 square kilometers. It is also a splendid natural place where to spend your holidays full of fun joints and nice hangouts. In addition, Umbria has the characteristic of being much less expensive than other Italian regions. Both your rental property and your daily expenses will be quite cheap compared to other places. Umbria is also a region with a great culinary tradition. History has certainly affected Umbria from a gastronomic point of view. The food, cuisine and wine traditions in Umbria deepen their roots in ancient history. During the Middle Ages monasteries were the protagonists of the gastronomic production. Here they prepared tasty dishes and great attention was given to food processing and parsimony. This is still true today and is mirrored in the daily life of Umbrian people. Doing with little, but creating tasty dishes, is an art that was well crafted in Umbria.